When studying the history of fashion, the breadth of potential people and companies to study is vast since, to the pleasure or disdain of historians, the amount of history only increases with time. But what about those who’s names time has forgotten? As a graduate student it is not uncommon to come across names that are less easy to research. Rather than using it as an obstacle I see it as a treasure hunt. If I were to tell you the last names Ferrè, Fath, Ferragamo, Fortuny or Ford, you could possibly guess all of their first names; Gianfranco, Jacques, Salvatore, Mariano, and Tom respectively. But what about Falkenstein? If you can’t then that is of no surprise. 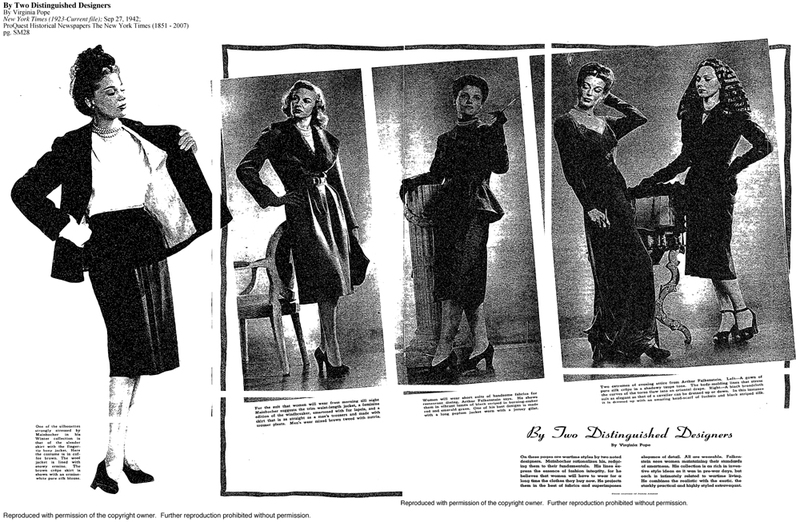 Most people don’t know that Arthur H. Falkenstein was, at one time, shown side by side with Charles James, Hattie Carnegie and Mainbocher in Virginia Pope’s coverage as a fashion journalist for the New York Times. In the press his name was always given in full, sometimes with his middle initial included, even though his label only listed his last name. Why his name hasen’t stood the test of time like his contemporaries remains to be found, but from what I gather, he wasn’t as much of a public figure, keeping to his studio and serving his clients, unlike Mainbocher, who let the fashion world know of his presence from his times as the Paris fashion editor for American Vogue, and then as the editor of the Paris edition of Vogue. 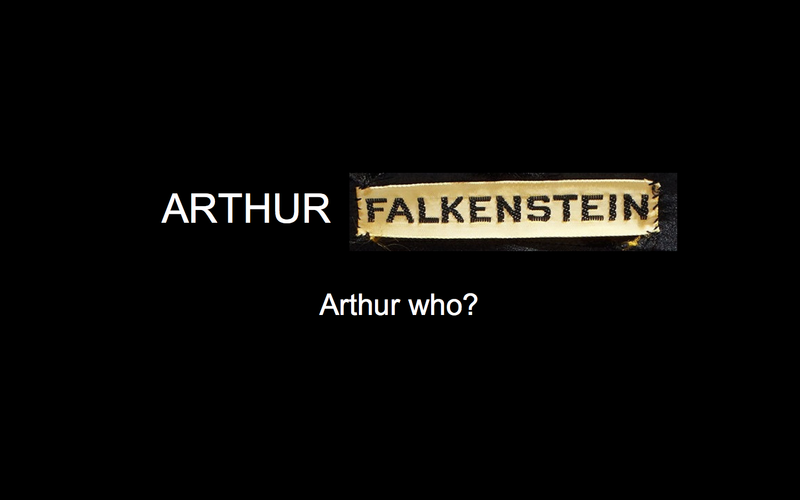 There is very little information out there on Arthur Falkenstein. Even his birth and death dates remain a mystery to me. In my research I came across 6 obituaries and one engagement notice that mention an Arthur Falkenstein, although never one for the man in question. I believe that these are for at least three if not four or more Arthur Falkenstein’s that lived in New York area. After many hours of continuous hunting I will resign myself to the fact that all I can find for a date range is that he was active during the late 1930’s to the beginning of the 1950’s. He may still be alive for all I know, although if that is the case, he is close to if not past 100 years old. A second question, which is more easily answered, is where he worked . 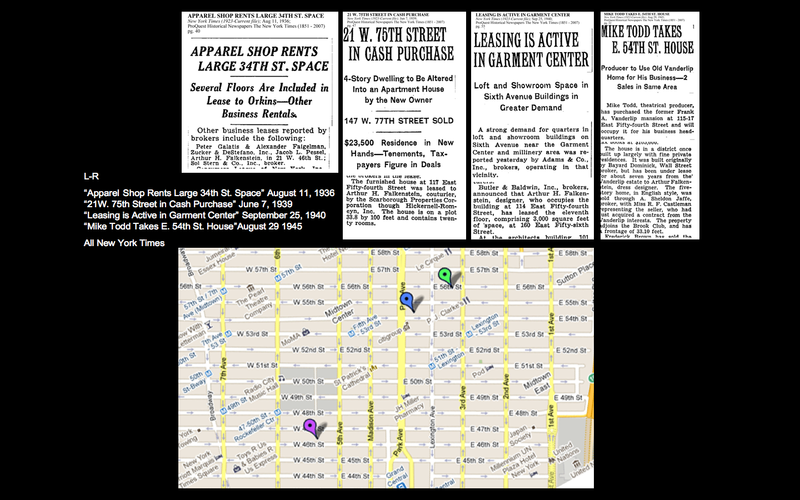 According to four articles I could find in the New York Times, he moved into his West 46th and 5th street storefront in 1936 (purple marker). Three years later in 1939 he moved into a small house on East 54th and Park (blue marker). The following year he either moved his storefront or expanded to a second location at East 56thand Third (green marker). And at the closing of the war in 1945 the building he was living in at East 54th and Park was sold to Mike Todd, a theatrical producer. I have not visited any of these location yet but I will be in the near future. These little nuggets of information are only really useful when playing a rousing game of “name all the fashion designers you can” but I bet that there are a few Falkenstein’s hiding in closets, attics and shops all across the US just waiting to be found. His clothing can be found in museum collections (FIT, MET, LACMA) and being sold online in various places. Not to sound like an investigator, but if you or anyone you know has any information on Arthur Falkenstein, please contact me at cmhyyz@gmail.com. Although my project is over I am still on the hunt for more information. 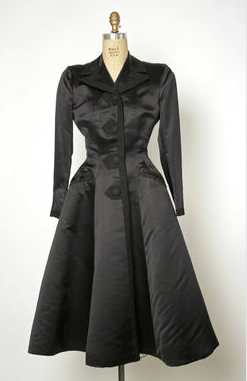 This entry was posted in Uncategorized and tagged 20th Century Fashion History, Arthur Falkenstein.. Bookmark the permalink. 1 Response to Arthur Falkenstein. Arthur Who?